Recently I went on a little sojourn to Adelaide with three friends to meet up with the awesome Justy and Pips who relocated there from Melbourne exactly one year ago. We had an absolutely delightful extended weekend that involved a whole lot of cheese, a whole lot of wine, and rather more fart jokes than I would have anticipated. It was brilliant fun. This weekend I thought I would share wine related stamps, and remember the great little holiday we had. We spent one night in the Barossa Valley, (which is depicted on the above stamp) and over two jam-packed days we visited about half-a-dozen wineries in the region. The Barossa Valley is known for its Shiraz and we certainly did a good job of sampling as many different examples as we could. 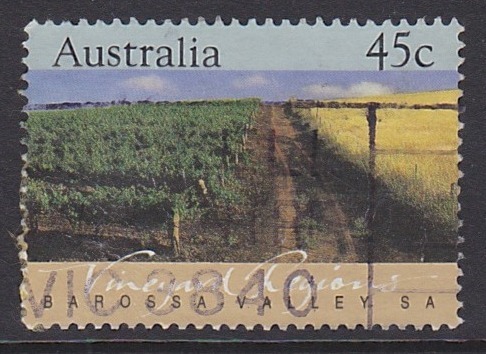 The Barossa Valley stamp was issued in 1992 as part of a release celebrating Australia's famous wine-producing regions. I haven't been to Margaret River or Coonawarra yet - but after such an enjoyable time taking in the spectacular vineyard views, relaxing by warm fireplaces, sipping on wine and tasting cheese - I think I am definitely going to add these destinations and some more wine-region-touring to my holiday wish-list. Thanks to my lovely friends for such a relaxing and enjoyable long weekend away!! This has been an entry into Viridian's Sunday Stamps. 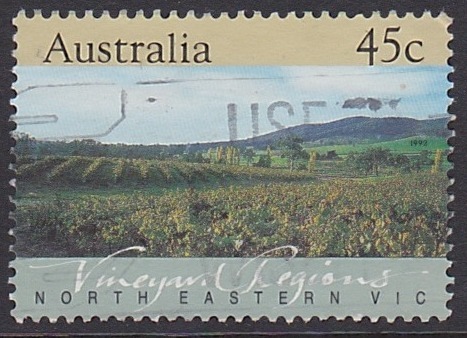 I love the stamps with the grapes on them. Maybe you can extend the wine tasting expeditions to Italy. Sounds like you had a great time - enjoy the good life! hmmm... Italy sounds like a marvellous idea! Italy is also on my holiday wish-list. This isn't too much of a distinction, though, because nearly everywhere is on my holiday wish-list! Lovely stamps, I have never seen them before! There is always something fascinating about rows of vines, maybe it is the thought of the end product. Nice views. Those stamps are pretty and a good way to remember your holiday. The first two stamps are esp. nice. thinking of you off and on this week. I hope you are doing well. thank you for participating. Thank you, Viridian, I appreciate it. It looks a beautiful place to visit. Ahhr the end to a near perfect weekend, bought some Swedish FDCs in a flea market in Malmo, read your blog, thought about the great Bordeaux Reds I'll drink this week, bought a 1 litre bottle of Gordons Gin + 500ml Swedish fire water for less than $AU30 bucks and the pies flogged Gold Coast by >90 points....sometimes life is very good! Where did my beautiful picture go? These are all new to me. Great stamps. Nice collection - I remember my visit to this region way back in 89. I think that was a good year - I enjoyed everything I tasted, as I recall! Well, the word on the street is that the 2012 vintage is going to be a bumper one: apparently the conditions for wine production were perfect this season in the Barossa. So keep your eye out for South Australian Shiraz! Nice blog you have here! If you want, come visit mine and join in my project called package pals! I will have to share these with my husband - he is starting to make wine. The Finger Lakes region, where we live, is known most for Riesling. Wow - a husband who makes wine. Definitely a keeper! That is an awesome endeavour. I hope it all goes well and the wine tastes great!